Although it isn’t common or popular, there are thin shell concrete structures that are energy efficient, can withstand hurricanes and tornados (not to mention small arms) and aren’t susceptible to fire. I won’t drop a company name but I did visit one and learn their process during a week long training. 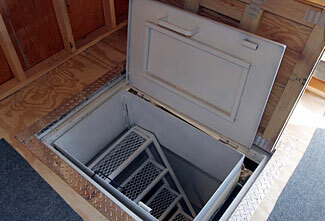 I think any “prepper” would love to have one, and the cost is comparable to stick built (for new construction). The whole home can be your safe room. Thanks for your note and comments. First, the thing we agree with. Yes, indeed, your entire home should be your safe room. That is definitely the way to go. Second, the neutral comment. Please feel free to mention specific company names. It is all helpful information, there’s no need to hold back. Third, the, ah, other thing. 🙂 Thin shell concrete structures may well be resistant to small arms fire, but we are guessing when you say ‘small arms’ you mean pistol rather than rifle fire. This is an essential issue to get right. We think that if there is an attacking force that you have to shelter from in your retreat and attempt to repel, it is almost 100% certain that they’ll be using rifles rather than pistols. The thing we’re not quite sure of is the caliber of their rifles, and we’ll concede there will be some AR-15 type rifles using 5.56mm ammo. But we’re also sure that at least some of the rifles will be .308 caliber. And that is potentially a huge problem in terms of ballistic resilience. Please see our article Two Things Your Retreat Exterior Must Be and in particular, look at the header picture that shows what happened after just two .308 rounds hit the pictured concrete block. If the material you are recommending can absorb more than two .308 caliber rounds without being blown to smithereens, then yes, please – do tell us more about it!